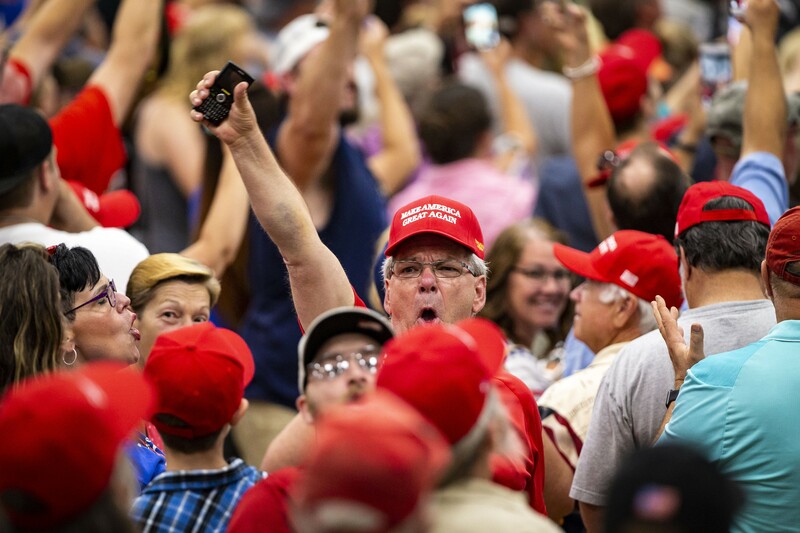 A man yells at reporters at President Donald Trump's rally at a high school outside Columbus, Ohio, Aug. 4, 2018. Disputes over politics have divided Americans’ homes, strained marriages, ruined friendships and invaded the workplace. Ken Storey was in a pique, the kind that often seizes and overwhelms the better judgment of people who follow politics closely these days. Those 145 characters, which soon bounced around among conservative activists online and became the subject of several Fox News segments, would cost him his job as an adjunct sociology professor at the University of Tampa, incite death threats, strain his relationship with his parents and, nearly a year later, leave him living on two part-time jobs that pay less than a third of what he used to earn. To a degree that is unique to this period and this president, disputes over politics have divided Americans’ homes, strained marriages, ruined friendships and invaded the workplace. Interviews with voters across the country, along with an analysis of recent research by political scientists who specialize in partisan division, suggest that politics is changing how Americans think and behave in new and unsettling ways. Experts point to several reasons. The volume and sheer ubiquity of information about politics, combined with Americans’ ability to instantaneously render public judgment on one another’s views, has made the political conversation much noisier. And for the first time the country is led by someone who inflames that conversation on a nearly daily basis, taunting his adversaries on Twitter. Partisan identification is now a bigger wedge between Americans than race, gender, religion or level of education. The Pew Research Center found last year for the first time that the gap between Republicans and Democrats dwarfed gaps between people of different races, genders, religions and education levels. Sixty percent of Republicans and 65 percent of Democrats interviewed by Pew in a separate survey in March said that people who feel differently than they do about how Trump is handling his job probably do not share their values and goals.